What is a Which? 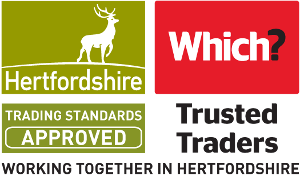 Trusted Traders Hertfordshire Trading Standards Approved Endorsement? We have a free design service where the designer will visit you on site, take measurements and listen carefully to what you wanting to achieve the wish list for your new kitchen/bedroom. Please call us to discuss how we can help you achieve the home of your dreams. More details are available on our website. Our fitter was the same one we had for our kitchen. He was prompt, reliable, friendly and did a very good job without any fuss. Julie and her team were nothing short of brilliant ! A previous design by a mainstream competitor left us uninspired but Julie showed imagination, attention to detail, stuck to the brief and kept costs within budget and delivered on time. She also showed a lot of patience and wasn't afraid to give advice where needed. We are building another property within the next 2 years and won't bother going anywhere else ! Well done Julie , Gold Medal standard service. We had Roland Bennett as our fitter for our D J Design kitchen. Roland, Andrew and Nigel were just the right team . They were friendly and trustworthy. Roland kept us informed all of the time, made changes when and where required without fuss and above all was able to solve problems to keep things moving. He was also punctual and was there when he said he was going to be. We were glad we had him on our side as we were able to rely on him. A big thank you and very well done. DJ Design is a family run business and therefore, you get a very personal and caring service. From our initial enquiry, nothing was too much trouble and the level of advice and guidance was outstanding, not to mention exceptional value for money. No delays or hold-ups. We are thrilled with our new kitchen! Roland Bonnett was the fitter for D & J Designs. He fitted our kitchen without any fuss, was prompt and kept us informed at all stages. He had to plaster all the walls before starting and did a very thorough job. DJ Design have recently supplied our hand-painted kitchen and we are delighted with the finished article. From design, supply and fit, the standard has been high. DJ's fitter Aiden worked wonders with our non too level walls and floors and the result is a kitchen which looks and performs to our expectations. We have a small kitchen and it's now much easier to work in. The design was a happy combination of our wishes and D J Design's advice; it suits our needs perfectly. As we are in our 70s, special thought was put into future-proofing the kitchen. The installation was carried out expertly and the fitter, who was an excellent problem-solver, managed the whole process, with the plumber and electrician fitting in seamlessly. We are very pleased with the end result. In may - had new kitchen installed. - design and fitter - Ronald with his team Andrew and Nigel were professional, efficient and friendly. Very trustworthy. Would highly recommend. We asked DJ Design to update our existing kitchen with new doors, new cupboards where necessary, and new locations for the oven and fridge/freezer The result is stunning, looking like a complete redesign. The fitter, Aiden, has done meticulous work with amazing attention to detail and the lighting and appliance wiring has been expertly updated by Chris the electrician. This was all done with the existing flooring in place: some small alterations were necessary and Aiden has done these invisibly. I would be very happy to recommend DJ Design and I wouldn't hesitate to call on them again. We have had a stunning new kitchen fitted with which we are very pleased. It was so well designed by Julie who was very helpful throughout. Also the tradespeople recommended were very professional and meticulous with their work. We have no hesitation in recommending this company.